Petrolheads love the Nissan GT-R because it’s such a great car to drive – and now it’s just got better. Nissan’s four-wheel drive supercar has received a round of enhancements aimed at subtly boosting the responsiveness of its 550PS 3.8-litre twin-turbocharged V6 engine while improving ride and handling at the same time. Other highlights include suspension upgrades for improved ride comfort and sharper handling. The firm has also been applying lessons learned from this year’s Nürburgring 24-Hour race to the roadgoing GT-R with engineers improving the response in both the mid- and upper-rpm rev ranges. They’ve also improved body rigidity and made changes to the dampers, springs and front anti-roll bar. 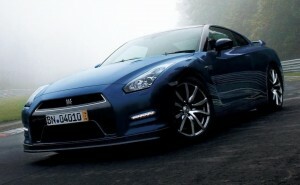 As a result, the GT-R is more responsive, has better high-speed stability and a more refined ride. Nissan will reveal full prices and exact performance details closer to the car’s launch next Spring. * Make inquiries now about leasing the new GT-R model because it’s probably the best way of actually owning one. This entry was posted in News and Views and tagged caption, car, gt-r, LS, nissan, nissan gt-r, price, speed by Steve Lumley. Bookmark the permalink.